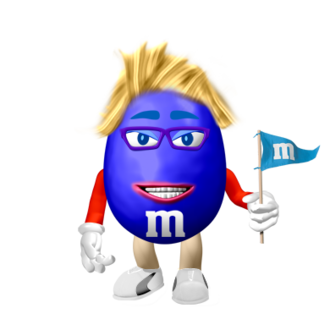 If I were an M&M . . .
We haven’t told our daughter about cystic fibrosis yet. She visits me in the hospital, and will many times in the future. She sees me doing daily treatments, and is here when the agency nurse draws blood while I’m on home I.V.’s But we haven’t given any of this an identity yet. We treat my CF like a business, or business as usual, with no emotions when I leave for the hospital. It’s a way of life and is like me going on a trip – one she can join on weekends. I can’t say if what we’ve done is right or wrong – it’s how we’ve handled it. And it seems to work for us. Our daughter loves life, thinks completely about herself and her world and how many treats she’s going to get and how much Wii time she’ll have and just how much fun she can have in a day. That is what I call completely normal behavior for a happy 8-year-old. I must have the brain of an 8-year-old because I think the same way – when can I have my M&Ms today? If we gave the battle a name it might zap her buzz. And one day we may have to zap that buzz, but why do it any sooner than we have to? That’s not to say we’re doing the right thing by hiding it. We each do what’s best for us. We just never mentioned it and are hoping we can prolong it as long as possible. We may, one day, wish we had introduced it earlier, having backed ourselves into a corner. We’ll see. My wife and I don’t really talk about CF a lot anyway, except for the bills it generates. We try to ignore it, hoping, perhaps, it will get bored and go away. How much broccoli do I have to eat to make that happen? But my daughter is starting to become aware of my limitations or lack of wind power. We were scootering up a moderate hill yesterday. My wife, the aerobic animal that she is, shot to the top, while my daughter hung back. I thought it was odd the little scooter maniac stayed behind, as she doesn’t like anyone to ride ahead of her, inheriting her competitive streak from me. “Why aren’t you up with your mother?” I asked. “I’m waiting for you. Can you make it up the hill, Daddy?” she asked, in a gentle and loving voice. Earlier in the evening my wife and I were talking about going to a concert at the Hollywood Bowl and I remembered the big hill you have to climb, which might cause hemoptysis. Little Miss Elephant Ears must have overheard part of the conversation. So, it was sweet that she showed concern for me in the sincere way only kids can do. But it was sour at the same time that CF created her concern for me. I’m lucky. I’m lucky. I know. I do know. 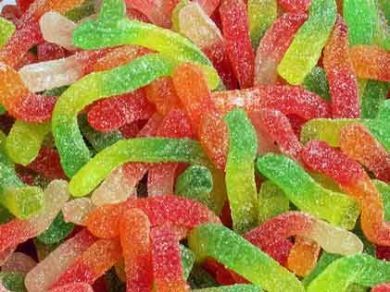 But some days CF tastes like a sweet and sour gummi worm – with its brief sweet taste and sour punch – Doctor says: “Your heart is in pretty good shape considering CF” – sweet. “There is, however, mild pulmonary hypertension” – sour. To which I reply: &$% you, cystic fibrosis, &%(* you, you piece of *$^#. Then I feel better. Much better. 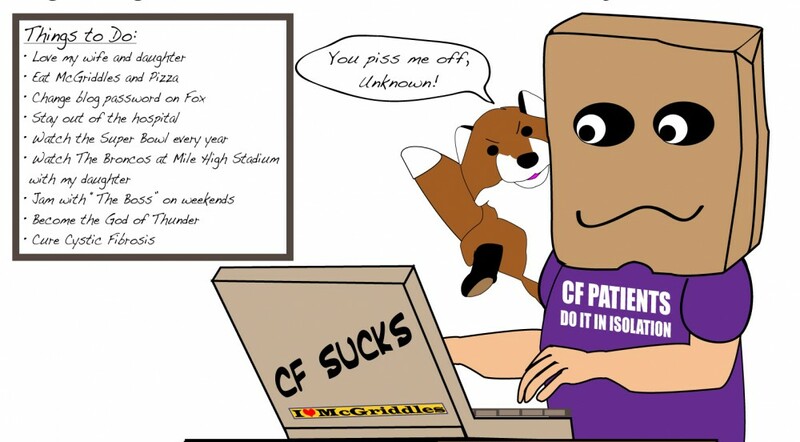 This entry was posted in cystic fibrosis, Love and tagged cystic fibrosis, fighting cf, For my daughter by unknowncystic. Bookmark the permalink. Your daughter sounds like a star to me. I am sure that when it comes to it she will surprise you with her bravery and resiliance. Thank you, Matt. That is my hope. It doesn’t sound like you are going out of your way to hide it. You simply aren’t making it the focus of your world. Your daughter (and most children in general) are smarter than people give them credit for. She will figure it out eventually, so why worry a little one if you don’t have to? Even though I can’t say what I would do in your situation, I feel like I understand why you chose this path and I respect it. Not that you give a rip what I think, but it’s just my two cents. Peaceful things, UC. You are a good dad. I do give a rip about what you think. I value your opinion and thank you for sharing it. You’re on the mark that we have not made it the focus of our world. It has such power over me, I’d hate to give it power over her. I’m doing my best to be a good dad, but some days that goal goes sideways by reality and the actions and words of young ones that you can’t prepare for. Still, it’s all good. My kids know the term “65 Roses” and they know that it is a disease that requires me to take care of my lungs. Beyond that, I haven’t shared details. Kids can only take in information in small doses. I would NEVER share progosis information with them at this young age. My daughter asked my husband the other day if he has a disease. That killed me… I know her little mind is trying to take stock and figure out if she will be taken care of if I kick it. I have made sure to reassure her that I am feeling healthy and strong. I think the most important piece of information to share with kids is that none of this is thier fault. Children will often believe that they somehow causes this bad thing to happen. I have heard all kinds of these types of statements from kids “Maybe if I would have eaten my vegetables like my mom told me I wouldn’t have gotten sick” or “Maybe if I would have listened to my parents more my mom would not have gotten sick”. I do reassure my kiddos any time the “65 Roses” conversation comes up that they didn’t cause this… All of these conversations have been very casual. No big family meetings to discuss. uGH, I wasn’t finished yet. Anyway, the other thing we always tell our oncology families is to be honest with kids on a level they can understand. So I have given you a couple pieces of advice to help you when the time comes that you want to discuss with your daughter. However, it’s so much harder than it looks. Easier said than done. I struggle every time my kids have a question or I feel I need to tell them something about my health. I am constanly second-guessing myself about what I say and do in these situations. Thanks again. I look forward to more conversations about this. Great post, UC. Great kid, too. Thank you, MC. Very nice of you to say. It’s all her mother’s doing.